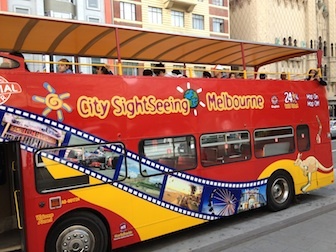 You must collect your ticket from City Sightseeing Office in Federation Square before joining the tour. Whether your preference is tasting the delights whilst strolling through the many bustling laneways, taking in a major event, immersing yourself in the rich arts and cultural offerings or doing some shopping you can see it all as you hop on and hop off at any one of City Sightseeing's 23 stops. With great views from the top of the bus and an informative audio commentary this is the best way to see the many attractions on offer. The bus departs every 40 minutes for the City tour and every hour for the St Kilda tour. The bus departs from Federation square and you can visit the Melbourne Aquarium, Crown Casino and Entertainment complex, DFO at South Wharf, Melbourne Star at Harbour Town, Etihad Stadium, Victoria Market, Melbourne Zoo, Lygon Street, Melbourne Museum/IMAX, Comedy Theatre, Fitzroy Gardens/Cooks’ Cottage, MCG, South Melbourne, St Kilda/Luna Park and Port Melbourne.